Conservatives Of The Upstate: Freedom From Religion Foundation - Not Even Quotes Are Safe? Freedom From Religion Foundation - Not Even Quotes Are Safe? The Freedom From Religion Foundation, the organization that bullied the Pickens County School Board into dropping prayers mentioning Jesus before school board meetings has a new target; quotes from famous people. "That this nation, under God, shall have a new birth of freedom." "We have a great dream. It started way back in 1776, and God grant that America will be true to her dream." 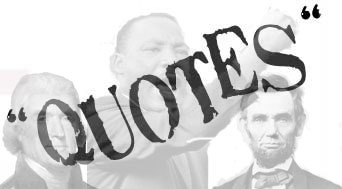 The FFRF is demanding that the U.S. State Department remove these quotes – which were actually said, by real national heroes, at historically significant moments, about pivotal events in our nation’s history. If they mention God, we have to remove them from history? The First Amendment is not a mandate to whitewash history. The Constitution is not a manual for the cleansing and expulsion of religious references from public life. FFRF’s co-president Annie Lauri Gaylor inaccurately asserts, “The United States is governed under a secular and godless constitution ...”.